Seattle is the latest in a long line of cities who have excised a tax on sugary beverages, with astonishing effect. The city who has introduced a $15 minimum wage that has killed jobs is now the proudest new owner of the sugary beverage tax. At 1.75 cents per ounce, the Washingtonians have the second highest sugary beverage tax in the nation. The tax went into effect at the turn of the new year and residents are already beginning to harvest the huge price increases that their retarded voting records have sowed. Only a few cities have enacted such draconian measures across the country in order to curb the obesity epidemic in the country. A higher consumption of refined sugars is linked to diseases such as diabetes, heart failure, obesity, and some kinds of cancer. This, however, is just the nanny state overload that Democrats love to vote for that costs everyone their money and time. This is not how you solve the problem. Stop subsidizing sugar for starters. On the surface, a 1.75 cent tax per ounce doesn’t sound that extreme, but it can add up quickly, especially for bulk buyers. 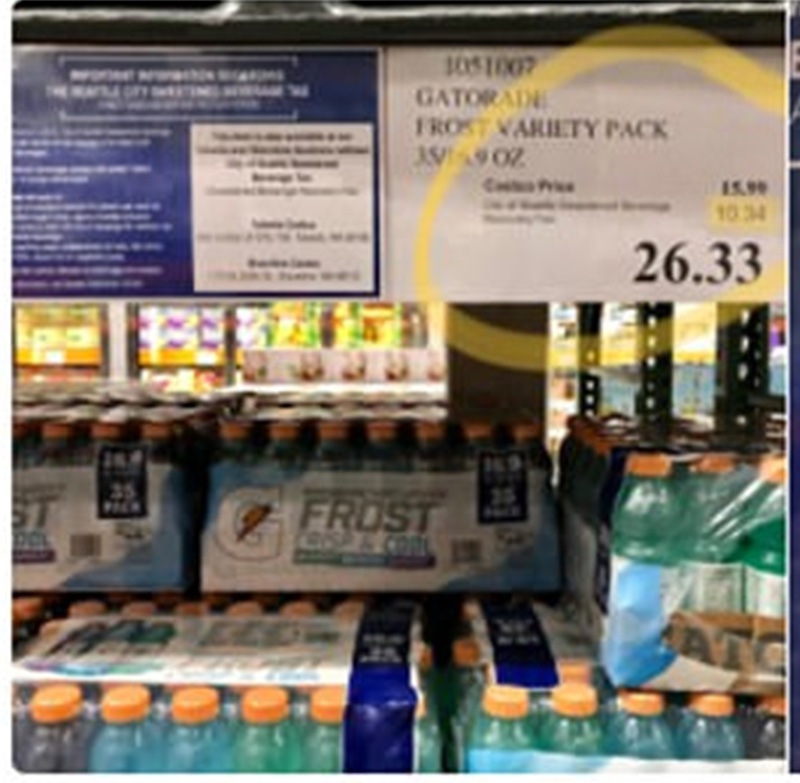 Photos of a bulk package of Gatorade from a Seattle Costco has made the rounds and perfectly sums up the problem in one clear picture: a $15.99 priced bulk package of Gatorade now costs $26.33. Some products are priced in a way that causes the final price to be more than double the original costs. This is ridiculous. Berkeley and Philadelphia both enacted their sugary beverage tax at the beginning of last year. Philadelphia charges 1.5 cent per ounce and Berkeley charges one cent per ounce. The result? Beverage sales soared in establishments that are right on the border of the cities. That is the problem with most one-size-fits-all public policy – human nature is rarely factored in. Holy sugary drink tax! Finally saw this w/ my own eyes. $10.34 of tax on a pack of Gatorade @Costco in #Seattle. ???? Boulder, Colorado has the highest sugary beverage tax in the nation at two cents per ounce. It has caused sales in those cities to go down, but what is usually glossed over is that soda sales have been going down in recent years anyway. People are starting to recognize that it is not good for the body and that the USDA has lied to us about what constitutes a healthy diet. There is probably nothing wrong with drinking a soda once in a while. People who drink a Big Gulp everyday are probably going to get diabetes. This is apparent to anyone with a modicum of intelligent thought. We don’t need the government to enact these awful taxes.